Click on this photo to see photos of home-cooked recipes from Tender Grassfed Meat. That is typical of a culture that no longer values cooking, one of the oldest and most vital human skills. In fact, two-thirds of American adults know almost nothing about cooking, and never cook. To these folks, cooking means heating up an already prepared product in the microwave, or warming up takeout that has gotten cold. Suppose you had the power to create an almost magical medicine that had no side effects, yet gave you strong bones, powerful muscles, strength, stamina, great vision and hearing, a happy optimistic viewpoint, a clear mind that can focus on anything, a great memory, an immune system so strong that you almost never get sick? Suppose this power and this medicine brought great happiness and pleasure to all who used it? Would you want this power? Well, you can learn this power, and make that medicine. The power is cooking, and the “medicine” is real food. Nothing affects the health of our bodies as much as the food we eat. Our bodies are made of the food we eat. Our bodies use the food we eat to repair themselves, to run the natural functions of the body, and to get energy. We need the right kinds of food, and enough of it. If people do not have enough food, they die. If people do not get enough good real food, their health deteriorates and they become vulnerable to all kinds of diseases. Doctors and hospitals can be very good for traumatic injuries, and some very serious conditions, yet their drugs and surgeries and radiation cannot keep our bodies healthy. Only food can do that. In ancient times, and actually until the twentieth century, most food was real, and grown and produced in accordance with the laws of nature. Countless generations of humans had eaten this kind of food, and our bodies adapted to using it. The main problem was getting enough of it, and obtaining certain foods that could be hard to get. In modern America today, most of the food has been raised with chemicals, and has been altered. Fruits and vegetables are grown in poor soil with the use of chemical fertilizers. Produce has been altered to have a longer shelf life and better appearance, at the cost of taste and nutrition. Meat animals are fed substances unnatural to them, that cause the very composition of their fat and meat to change. Antibiotics, growth hormones, and other drugs are used to cause meat animals to grow faster. Humans have never eaten this kind of modified food before the twentieth century. Real food is the unmodified food of our ancestors, grown in good soil, or grazed on good grass, without the use of chemicals. It is what our bodies know how to process, and we thrive on it. But it is not enough to just buy real food. You have to know how to cook it. The art of cooking transforms produce and meat into almost magical creations that give our bodies the nutrition they so desperately need, and create great pleasure for the people who eat a well cooked meal. You cannot get this kind of food in a can or microwavable container. You can almost never get it in a restaurant. But you can learn how to cook it. You can create the magical “medicine” advocated by Hippocrates, which can keep your body healthy and functioning perfectly. Our ancestors knew this, and knew what foods to eat, and how to combine foods to sustain life and health. Much of this knowledge has been lost, yet much has been preserved. My major motive in writing my cookbooks, Tender Grassfed Meat and Tender Grassfed Barbecue, has been to rediscover and preserve some knowledge of how to cook grassfed meat, perhaps the oldest and most valued food of humanity. Learning how to cook and eat this meat and other real foods healed all the problems that modern medicine could not help me with. I am an attorney, yet cooking real food is my most valuable skill, without a doubt. A feast at the end of the year is a very old European tradition, going back to the days before Christmas was celebrated. This holiday was often known as Yule. It has generally been replaced with Christmas, which also traditionally includes a feast. It was common to welcome the New Year with a feast as well. These days, people are taught to fear their food. Fat from healthy animals, one of the most vital and nutrient-rich foods we can eat, has been demonized and blamed for heart disease, and almost every other chronic disease known to humanity. This is just not true. People ate foods rich in animal fat during eras where heart disease, cancer, and most other modern diseases were unknown. Yet the propaganda has been so effective that many people do not even know which foods were the traditional centerpieces of the holiday feast, and have never tasted them. Certainly, skinless, boneless chicken breast, or skinless, boneless turkey breast, from birds fed GMO soy and GMO corn, were never the center of the holiday feast. Neither were vegetarian concoctions such as soy substitutes for meat, laden with chemicals and flavor enhancers. The traditional centerpiece of the European and American holiday feast was a big grassfed roast, or pastured roast, or pastured bird, roasted whole with its skin intact. It is time to put the fear aside, and enjoy the rich, traditional bounty of the holiday. You do not have to restrict yourself to lean factory meats devoid of taste and nutrition. We can still enjoy the feasting traditions of our ancestors and the many health benefits of grassfed and pastured meats. This roast, grassfed until the mid-twentieth century, is a magnificent centerpiece for any holiday feast. Cut from the chine area of the steer, the most prized traditional cut, sometimes reserved for heroes, it is a magnificent sight. Resting on a natural rack of its own bones, covered by a thick mantle of its own healthy fat, it produces instant hunger when brought to the table. 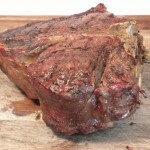 Prime rib has a unique taste of its own, that no other beef or meat shares. It is a truly wonderful taste, enhanced by being roasted on the bone, enriched by the melting fat that bastes the meat as the roasting proceeds. The natural fat cap helps keep the meat moist and tender, while lending a magnificent flavor. It is an old tradition to roast vegetables in the same pan as the prime rib. The vegetables caramelize in the flavorful fat that melts from the roast, developing a depth of flavor that must be tasted to be believed, turning crusty on the outside while remaining tender on the inside. Organic potatoes reach their height of perfection when roasted this way, which also adds scrumptious flavors to peeled and sliced carrots and onion wedges. A traditional grassfed prime rib roasted with vegetables in this manner is perhaps our favorite holiday meal, which we have at least once every holiday season. You can see a photo of one of our holiday prime ribs above. A whole tenderloin of beef is another holiday choice for a special meal. Grassfed tenderloin, in particular, has a wonderful flavor. Tenderloin is naturally lean, and traditional preparations add fat to it in many different ways. It often had slivers of bacon inserted in the meat, a process called larding, that used a special needle. It was often wrapped in pork fat, or beef kidney fat. It was often marinated in oil with herbs. Many times, it was coated with large amounts of butter and basted as it roasted. Beef Wellington, page 92, Tender Grassfed Meat. Yet our favorite method of cooking this magnificent, luxury cut is to cook it in a rich pastry, made with huge amounts of butter, known as Beef Wellington. The meat is coated with a mixture of finely chopped mushrooms and onions, sautéed in butter until they have shrunk and caramelized, which greatly intensifies their flavor. The coated meat is than wrapped in butter-rich puff pastry, and roasted to tender, flavorful, perfection. The smell of the roasting grassfed meat, butter, and mushrooms makes you so hungry, and the sight of the wonderfully browned pastry as it is carried to the table is something to behold. The combination of the tender grassfed meat, sautéed mushroom coating, and buttery pastry is wonderful beyond my ability to describe it. Castillian Rack of Lamb with Chine, page 167, Tender Grassfed Meat. The rack of lamb is cut from the chine portion of the lamb, traditionally the most valuable and cherished cut. This cut is also a great choice for a holiday feast. Many people, especially in the U.S., think they do not like lamb, but that is only because they have not had quality grassfed lamb, from a traditional meat breed, which has a mild yet wonderful taste, especially when served rare to medium rare. A rack of lamb has been prized in Europe as a holiday feast for a very long time, and we have learned how to enjoy this tradition as well. Racks of lamb are often “Frenched,” which usually means that all the fat is trimmed off. I do not recommend this, as the fat is crucial to a magnificent roast. Sometimes during the holidays you will come across a “crown rack of lamb,” which is cut in such a way that it is almost guaranteed to come out overcooked. I do not recommend this either. Most American butchers will cut a rack of lamb between each bone, to make it easy to carve into individual chops once roasted. I do not recommend this either, as it almost always results in an overcooked lamb that has lost far too much of its natural juices and flavor. The rack of lamb in our holiday feast rests on a natural rack of its own bones, retains a thick crown of its own magnificent fat, and is uncut and whole—no cuts between each chop to let the flavor out. It roasts quickly at a high heat, with organic potatoes and other vegetables in the pan, caramelizing in the melting fat, and taking on a wonderful, crusty flavor and texture. The smell of this cut as it roasts is almost as good as the taste when it is finally served. It is important to serve lamb hot, and not let it get lukewarm or cold. But the flavor of a true grassfed lamb, from a traditional meat breed, is magnificent. No article about holiday feasts in winter can be complete without at least a mention of roast goose, which was one of the favorite Christmas meals in Europe for many centuries. In fact, having a roast goose for Christmas was so important that many employment contracts provided that the employer would give the employee a fat goose at Christmas time—it was that important. Goose is not commonly made these days, and is a bit tricky to get right, but when you get it right, it is something very special. The plentiful, crisp skin is in a league of its own, being an incredibly satisfying mouthful, with a wonderful texture and flavor. The tender dark meat has a great depth of flavor which sets off the crisp skin perfectly. Any traditional holiday goose will include a delicious stuffing, often rich with apples, which go perfectly with the goose meat. And the traditional gravy, flavored by the rich, caramelized drippings, is something special, a symphony of flavors that enhance the stuffing, the skin, and the flavorful meat. The goose gives off a lot of fat when roasting, so much fat that it must be carefully drained at various times during the roasting. Traditionally, this fat was saved, and used for cooking, and for healing. I have saved goose fat in this matter, and it is one of my favorite fats to cook with. There are many other traditional centerpieces for the holiday meal, including hams (both cured and fresh), duck, capon, turkey, leg of lamb, rib roast of pork, roast pork loin, roasted beef strip loin, roast saddle of lamb, and others. All of them are roasted whole, with plenty of their own fat, and usually roasted on the bone. Our ancestors knew how to celebrate with food! My first cookbook, Tender Grassfed Meat, contains many recipes for prime rib and rack of lamb, and the best grassfed Beef Wellington I have ever tasted. 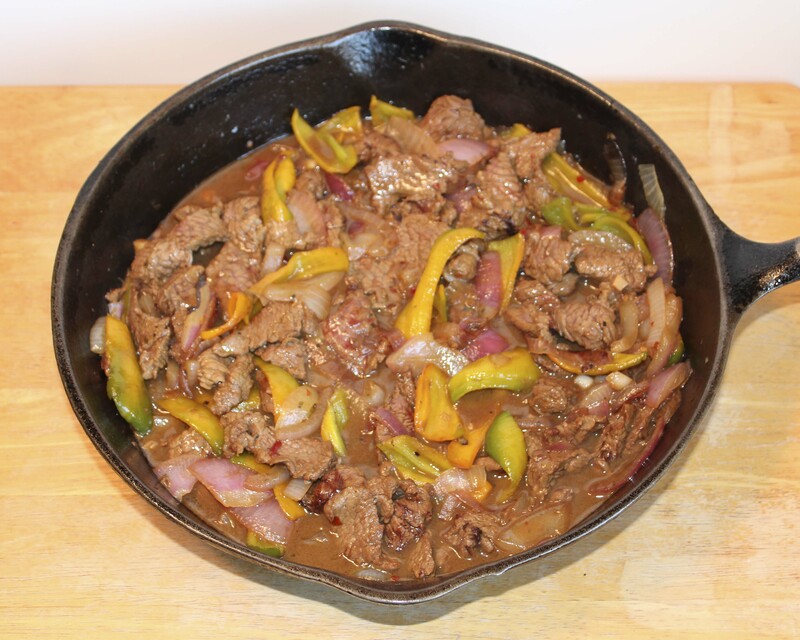 This grassfed beef stir-fry was made with organic shallots, onions, and Italian peppers. The United Kingdom in the nineteenth century was perhaps the wealthiest and most powerful nation on earth. One of the ways in which the British people of the time enjoyed that wealth was to eat plenty of meat, often grassfed beef. Beef was relatively affordable and plentiful in England at that time, as opposed to the rest of Europe, where meat, especially beef, was a very rare treat. Yet even the English middle and working classes had to watch their money, and they came up with a way to make beef go further. They invented the tradition of the Sunday Roast. A large roast of beef would be roasted on Sunday, and would be used as the basis of meals for most of the rest of the week. These meals would include cold-sliced meat, hash, curries, minced beef, broth, and meat pies, all from the same roast. Contrary to popular belief, leftover beef can be wonderful when twice or even thrice cooked, with a very deep and wonderful flavor. A bigger roast will often taste better than a smaller roast, but as there are three people in our immediate family, we did not make large roasts unless we had company. I decided to try reviving the tradition, but with a tastier selection of secondary dishes. This would also give me the excuse to make a large roast. The results were delicious, and surprisingly frugal. We made a large center cut shoulder roast, about five and a half pounds. This cut is also known as cross rib in the western United States. The roast was suitably marinated, and roasted, until fairly rare in the middle. The hot, juicy meat was wonderful, and satisfying, with a more developed flavor that comes from cooking a bigger piece of meat. It was so satisfying that we had most of the roast left over. I cut a large, single piece of the leftover roast and cooked it as a pot roast. The twice-cooked meat was so tender, with a wonderful deep flavor. It was fork tender, and no one would have thought it came from leftovers. It was very satisfying, and we had a fair amount of leftover pot roast and gravy. I took more of the leftover roast, the part that was made very rare, and sliced it into thin pieces for stir-frying. They were marinated with an oriental style marinade, and stir-fried with delicious organic peppers, shallots, and onions from our favorite vegetable farm. You can see a photo of this wonderful meal at the top of this article. It tasted even better than it looks, and no one would have imagined it was made from leftovers. I took some more of the leftover roast, cut it into small chunks, and made it into a stew with plenty of vegetables and Hungarian spices. It came out great, so tender and flavorful. Not like leftovers at all. I took the leftover pot roast, sliced it thin, and reheated it gently in the leftover gravy, enhanced with a sautéed onion and some more beef broth. Many traditional European recipes call for cooking a pot roast one day, and reheating it later. This is done so the flavor can develop in the refrigerator, and I must say that this reheated pot roast was over-the-top delicious, with a more complex and beefier flavor than the original roast. These slices were actually thrice cooked—first as a roast beef, second as a pot roast, and third as reheated pot roast slices. At this point, there was only about a third of a pound of scraps, including some sinew, left from the various meals. They went into the freezer to become part of a future homemade broth. By following the tradition of re-cooking the leftovers of a large roast, we had five wonderful meals, and some meat for soup. A complete success, moderate in cost, and absolutely delicious. 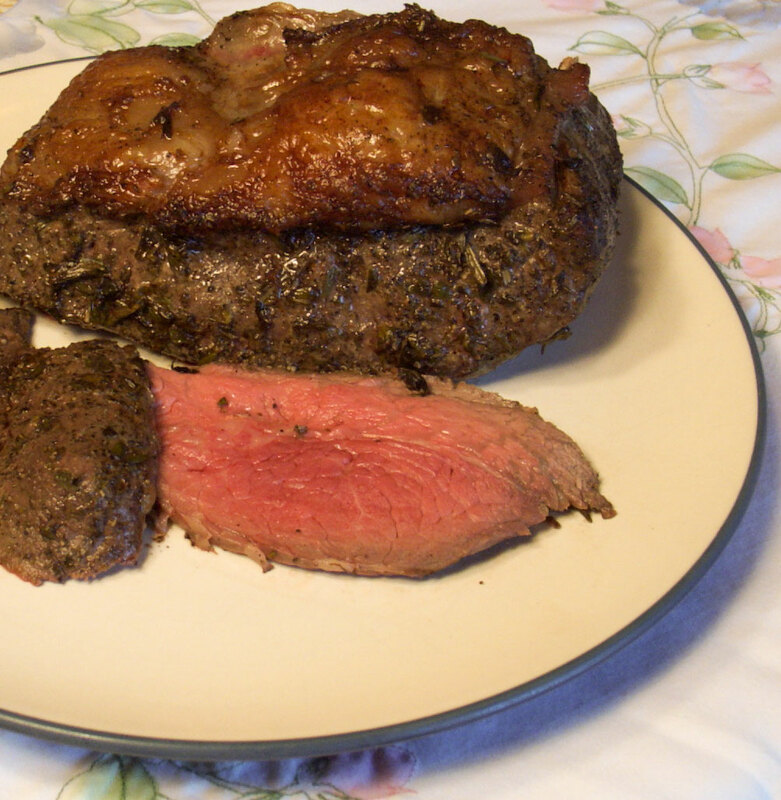 Tender Grassfed Meat contains a number of recipes for roasts, pot roasts, and stir fries. It is simple to modify one of the beef roast recipes for a larger roast, simply continue cooking at the lowest temperature in the recipe, until done to your taste. 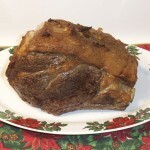 The pot roasts can be made from a large chunk of leftover roast. The stir-fries can be made from leftover rare or medium rare roast beef. The cooking instructions are the same, although a pot roast made from leftover beef may be ready sooner. Remember, when the fork goes in easy, the pot roast is ready. There is a reason why something becomes a cooking tradition–it works!